Best of GreenState Cannabis Awards 2018 and nominated for Best of 2018 OC Weekly, the Moonlit Moveable Feast is an extraordinary experience merging high cuisine, experiential activations, live music, and community building under the radiant full moon in Joshua Tree. 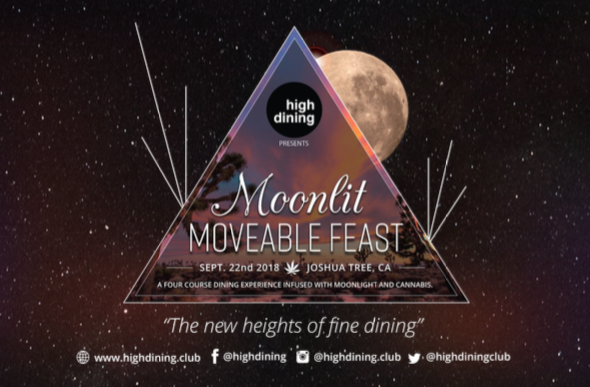 Cannabis experts and haute cuisine enthusiasts (foodies) come together during the Harvest Moon to enjoy the sensory delights brought to you buy the brilliant minds at HighDining.club and Mary Jane University. Recently returned from Marrakesh, Chef Sabrina Eustis is preparing a menu starring four luxurious Moroccan-inspired courses of cannabis-infused cuisine during this intimate dinner party adventure. ● Courtney Aura Freeman integrates crystals and cannabis for a unique exploration of crystal energy grids, science, healing and intention setting to raise the positive vibrations. ● Lynda Arnold a.k.a. Diva sonic of Sacred Frequencies Sound Healing will immerse you in sacred musical atunement. ● Walk through the fires of Live Glassblowing by artists Paul Kowan & Stephen Alan Hubbell. ● 3rd Ear Experience will provide a psychedelic soundtrack for an epic journey to the Moon, infused with Moroccan spice. ● Kyle Simon leads our guests in an audible dialogue with the Moon with his project, “The Sirens”. ● Lady NeJanna provides Angel Oracle Readings to connect guests with their guardian angels with a magical closing ceremony for all. We can’t wait to share this Harvest Moon with you. Please reach out with any questions or to see the sponsorship menu using the form below.